In recurrence with the Monthly Community Meetings and Focus Group Meetings Queerala hold, we call for our annual get-together’; a Day to rejoice and reflect our actions. 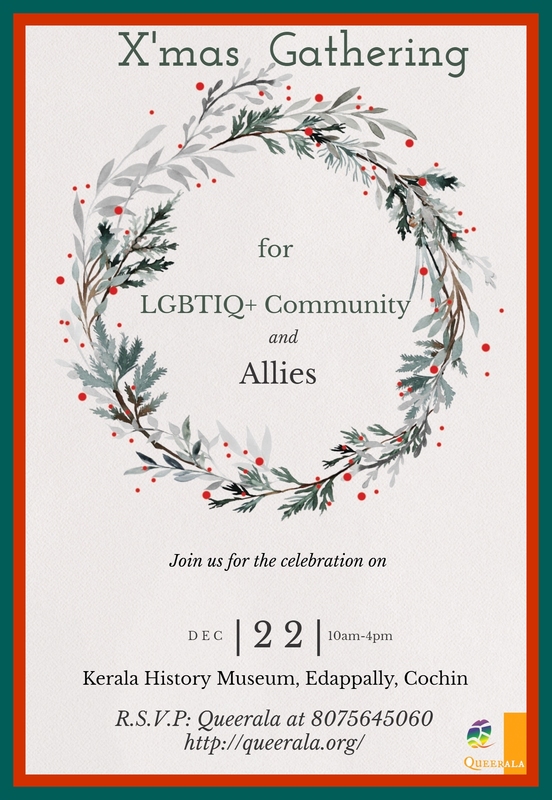 We are hosting a one day gathering for people from the LGBTIQ+ community and our allies, on 22 Dec 2018. The gathering shall cater experiences of some queer individuals, post the IPC 377 verdict, and familiarise the up-way challenges the queer community has to deal with, in Kerala. Our mission is to connect LGBTIQ+ community people with each other beyond the cyber-walls and experience the warmth of alliances. We, wholeheartedly invite persons who belong to the sexual and gender minorities and allies, to be part of the X’mas gathering, where at we all shall sing and dance, share food and gifts and be merrier. Those who wish to attend the gathering kindly confirm their presence at the earliest. Let’s create some misty ripples of Rainbow Love!